You have probably forgotten all about the wonderful 4th of July in Amherst, NH, but here is just a bit to ice your memories. Professor Lessig did indeed come to Amherst on the 4th, together with his NH Rebellion head man, Jeff McLean. Lessig brought his lovely wife, Betina, his three children, Tess, Teo and Willam. Mom and the two younger ones were on the Amherst Dem’s Float (winning best over all), while Dad and Willam (that’s right, not William) marched with quite a few others. I joined the Rebellion at the top of the hill, thanks to Rick Katzenberg, who let me park in his drive. Gail Denemark gave me her arm, and we made it the whole way. Joining in from WMD were Kathy Boyer and her husband Bob Wood, Vanessa Foley and her daughter Claire, and probably others I’m going to sadly forget to mention. The response from the parade watchers was wonderful – – made our hearts happy! On the following day Pete and I joined the Rebels at Fort Constitution, at the end of the 16 mile sea-coast walk which many completed. If you click on “photos” below, and go up and down patiently, you may find Kathy Boyer, Rosemary Carlsmith, Pete and Nan and others whose faces you recognize. Lessig gave an inspiring talk up on the wall, leading us to believe that anything is possible – – even getting money out of politics. If all goes as we hope it will, there will be a walk you will all want to join on Saturday, October 4th. My dream involves people making The Milford Oval the destination and walking on every road leading to The Oval. Brookline, Wilton, Lindeborough, Mont Vernon, New Boston, Amherst, Merrimack, etc. Can you see the web we will weave with people anxious to get BIG MONEY out of politics. This is just the beginning – – will you join us? Nothing has been confirmed regarding the October walk. But watch this space. Jeanne Ludt is back from Maine, our communication channels are open and there is mischief to make. Wish: I wish we could get all of the money out of politics. 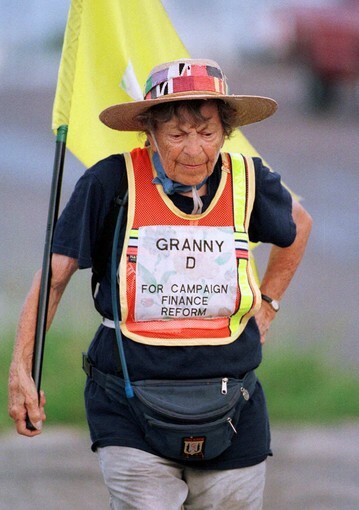 Granny D wished the same wish and marched from “Sea to Shining Sea” to try to do just that. Request: Please join us as “GD Walkers” in Amherst on July 4th. We’ll participate in the Amherst Parade. We don’t plan on walking under the WMD Banner, but rather under the new banner, NHR – – New Hampshire Rebellion. And, should you have some hesitation, GD Walkers stands for Granny D Walkers. The New Hampshire Rebellion was founded by Lawrence Lessig, Harvard Law Professor, who walked from Dixville Notch to Nashua in the cold of January. His movement is taking hold. To investigate further, please Google NHRebellion, Lawrence Lessig, or some such. You will find much to inspire you. This is just a first notice – – there will be more information to come. Should you wish to sign up for July 4th, give me a call at 673 3730, or respond by email to peteandnan@comcast.net. On July 5th, the New Hampshire Rebellion will be walking the New Hampshire Sea Coast of approximately 16 miles. We’ll join in for a portion of the distance. We’ll hope to see you there. You will find more about this too when you look into the New Hampshire Rebellion. You might want to wear a Granny D hat, wear a NHR T shirt, carry a sign about campaign finance reform, or make a bold statement about systemic corruption in the nation’s capitol. We will have no dress code. We will walk and talk because we care and because we think we just might be able to do something about this problem. Thanks for making time to read this! PS This year’s theme for the Amherst Parade is: “From Sea to Shining Sea” – – what could be more perfect? I am aquiver! That’s the best way to put it! Lawrence Lessig, the Harvard Law Professor who is the fearless founder of The New Hampshire Rebellion, will be in Amherst on the 4th of July to march/walk in the Amherst Parade. How cool is that? So, having had a weak response to my last request, I am on my knees begging you to join us on the 4th at Wilkins School between 9:00 and 10:00 in the morning to walk with others who have already signed up with the rebellion. It promises to be a wonderful experience. You will have a chance to meet Professor Lessig and hear for yourselves his inspiring message. Also, Jack Conaway, who is again “doing” the Amherst Dems float for the second year in a row, needs more marchers. Walk with them; walk with us. Stand up! Speak out! You will have a happy experience – – I guarantee it!! There will be a table on the Village Green where Lessig will be after the parade – – make a point of coming to meet him. Thank you for making time to read this fervent request. Thank you most of all for joining us on the 4th. I accept the challenge from Jeanne, who suggested there would be a summary coming after last evening’s meeting. We were eight, so we comprised a perfect group for discussion. At our luncheon a couple of weeks ago we were eight. However, we were not the same eight yesterday. Three attended both meetings; five joined us yesterday, two of whom were new to WMD. Adding that all up my way, we were a total of 13 people who had civil discussions on two different occasions. That number is so important. It was on March 13th in 2005 that WMD made its public debut, when a group of us attended a meeting in Milford with Charles Bass, then New Hampshire member of the House of Representatives. He was trying to convince our citizenry to privatize Social Security. When nearly all of the women in the Town Hall room stood with our group, we made an impression. It was “wicked cool”. It is an anniversary worth remembering, which is certainly why 13 people joined our interesting discussions. Is it a sign? We agreed that we need to be especially active this year and again in 2016, and certainly all weighed in on the Presidential Election of 2016. It was interesting to observe that we were not all in agreement that Hillary would run. It was suggested that we invite legislators to speak to us who might not be like-minded. Kelly Ayotte was suggested as a possibility. We agreed that we would like to grow our numbers and try to attract some young women. However, Jeanne let us know that our e-mail list numbers 180 some. I had announced that Annie Kuster would be coming to The Fells in April, but that announcement has changed. Annie will be in our home, which she preferred to do, on Sunday, April 6, 2014, at 4:30 in the afternoon. So the only change is the address. We are at #31. And, the event will be a “fund raiser”. We may not hold fund raisers at our Condo Club House. Annie suggests certain amounts for donations on the invitation which I will forward later. However, her organizer, Emily Brown, has made it clear to us that $25.00 donations are perfectly wonderful. Should you wish to attend that event, please be so kind as to give me a call so that your name will be on the list. We are at 673-3730. It is important that we know who is coming, as our capacity is less than that of the Club House. Yet, we don’t at all mind being cozy. We will be serving wine and something soft, but we would never say “no” should WMD members wish to bring a wee something to share. So we are coming out of hibernation. We agree to continue to “make mischief”. We hope to have monthly meetings or events. We will not be hyperactive, but we’re moving in that direction. Smith is author of the best-sellers The Russians and The Power Game: How Washington Works. He spent 26 years with The New York Times, receiving a Pulitzer Prize for his international reporting from Russia and Eastern Europe, and he was a member of the Pulitzer winning team that produced the Pentagon Papers. Smith received two Emmys and numerous other accolades for his work as a producer and correspondent for PBS. You have probably concluded that WMD has dissolved – – retired – – given up. The Kitchen Cabinet has found a better kitchen table? Sassy voices have been silenced by Ted Cruz and Company? Men have taken controls? OMG Au contraire, we have simply been hiding out, keeping a low profile, dusting, weeding, traveling, reading, singing, etc. Time has passed; little has changed. We are in about the same mess we were in when last we made comment or had an event. But, we are about to resurface. It’s time! My goals for the year 2014 are to increase Democrats’ lead in the US Senate, to take back the House of Representatives, to elect more women in New Hampshire, to have a large presence in the 2014 4th of July Parade in Amherst, to do the same in the Labor Day Parade in Milford, and to save the world. I will need your help. After a lengthy and traumatic exercise, involving two men (which complicated everything), WMD is pleased and proud to announce our first event. You will be SO excited! We invite you to join us, at the Club House at The Fells in Amherst, on Thursday, October 24th, at 4:00 in the afternoon, to meet Hedrick Smith. His profile is included at the end of this email. He is on a book tour in New Hampshire, organized by Ed Helm, and he will speak to us, take our questions and tell us about his latest book, “Who Stole The American Dream?” We will have Mr. Smith with us for only an hour and a half, so come prepared with your thoughts and questions. Pete and I know Hedrick Smith best from hearing him on Washington Week. For us then, he was the one who knew everything about Russia. We are thrilled that, finally, we are able to “book” him with WMD. This same day, in the evening beginning at 6:00, the Milford Democrats are having their big fund raiser at the UU Church in Milford. You will want to put that on your calendars as well. We should have just enough time to drive from the club house to the church after we have sent Mr. Smith on his way to his evening meeting. Note the date: October 24th Note the time: 4:00 in the afternoon Note the venue: Club House at The Fells Note the speaker: Hedrick Smith Put it on your calendar, in INK! PS Pete suggests that I beg for a big turnout. FYI, this was originally scheduled at St. Anselm College, but that fell through. Then he was to come to the Milford Dem’s “do” at the UU Church. Because that is a “fund raiser”, he could not. So, we have him and we are excited. Ed Helm, his “organizer” has attended at least one of our events, that being when we had Elizabeth Edwards and a turnout of around 120. The Club House has a limit of 60. Yes! Let’s try to fill the house and start our efforts off with a big bang. Pete and I have just made donations to both Gabby Gifford’s PAC and The Brady Campaign – – we simply used the email Jeanne sent yesterday, where we found so much to give us a nudge. We had turned on the President’s event just at noon; how many moments we found ourselves with tears in our eyes or goose bumps on our arms. Why has it taken us SO long to act? Was it that we simply could never imagine sending a first grader to school and never seeing them alive again. Our baby, our Heidi, celebrated her 49th birthday this week, just a day before Michelle Obama celebrated her birthday. Michelle, we believe, is just about the same age as our Heidi. Heidi started first grade in Fairbanks, Alaska. I would drop her off at the elementary school on base at Fort Wainwright, then drive the 20 some miles to North Pole, Alaska, where my first grade class of around 30 youngsters kept me “on my toes”. To even imagine someone harming a hair on any of those little heads never was a part of my thinking. How glorious it was to grow up and to raise a child never worried about gun violence or school shootings. Thanks, Jeanne, for sending so much good information. Thanks, Christy, for taking a stand and reminding us of our standing up and speaking out on Friday afternnons – – and any other time we have an opporknockity to do so. It is obvious we have an issue for 2013! Please join us on Monday to celebrate the Inauguration of Barack Obama. Let us please be a part of the solution he seeks. Let’s use our heads, donate our funds and help our President get something done this time. Our voices need to be heard.